When signing up for Bookshelf Plus using a gift card, you will login and go to the sign up page here. Due to the nature of subscriptions with auto-renewal, you will have to enter a credit card number to be associated with your subscription, even if you plan to cover all costs with an eGift card. After entering your credit card information, click on "Apply Subscription Gift Card". A new form will open. 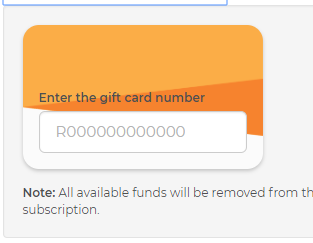 Enter your gift card number in the indicated box, including the "R" at the beginning of the number. When you are finished, click "Try it free for 30 days." Please be aware that you will only qualify for the 30-day trial once. To add a gift card to your existing subscription, go to My Account > My Subscriptions > Edit Subscription. On this screen, click on Update under the Payment Information panel. 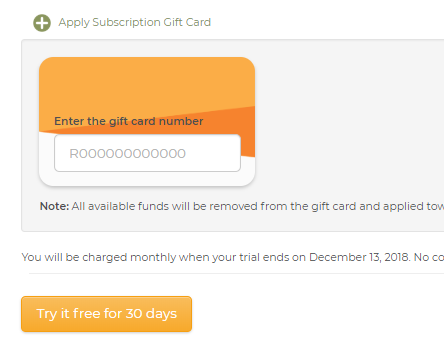 Next, click on "Apply Subscription Gift Card". Enter your gift card number in the indicated location, including the "R" at the beginning of the number. After you have entered the gift card number here, click "Update Billing Information". *IMPORTANT: Please be aware that all available funds will be removed from the gift card and applied to the subscription.